Zeke Will Always Be With Me on The Water and to continue the Love for Water and fishing adventures is my new Addition Boca! 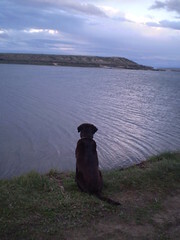 Man's Best Friend, The Ultimate Fishing Pal! 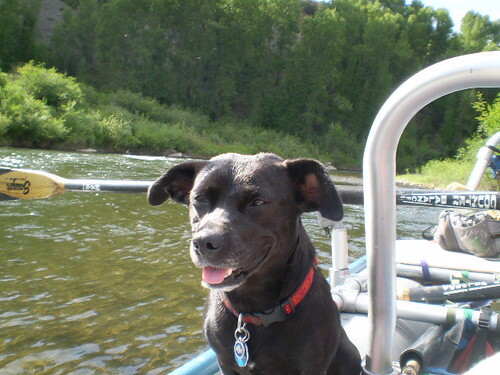 Read here to find out more about your best fishing pal and how man's best friend can make your day out on the water that much more special! 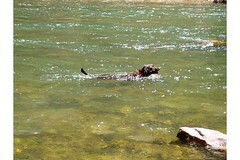 Reason I fly fish...My Zeke! 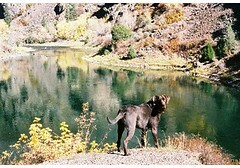 I love That Gunnison Gorge! 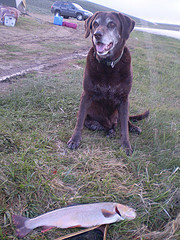 One amazing fact about Zeke was that he was the envy of most my fishing buddies. Zeke probabaly logged more time on the water each year than about 70% of my fishing Pals. Where were his favorite Waters of choice? Zeke didn't care, he could spot trout rising at 5am 70 yards out at South Delaney Buttes, point out a Caddis hatch on the Arkansas River, fend off fishermen within Papa's fishing zones on the Green River with his alligator tail, to hiking 25 miles into Wyoming's remote Bridger Wilderness for native Cutthroats when he was younger. Weather wise I think he's still a fan of the Nantahala Forest back in North Carolina in the Spring but the Colorado mountain air keeps him coming back for more. I think the total amount of rivers he's visited has to be in the 100-150 range with his Pops hitting close to 75 different bodies of water in just one year alone back in 06'. How far are those Class 5 rapids again? Always thinking of the one that got away! I could write a book on all of the fond memories I had with Zeke and our journeys all over the country fishing. From spending a few weeks in Montana fishing all over and running from bears to trips in Florida admiring Dolphins and pompano, it seems he's done it all. I just wish he could have joined me in my last big trip to Patagonia....it seems his fear of flying and remedial Spanglish got the best of him. I know that his big smile will be sorely missed by many and that our Camping trips will not be the same without him. 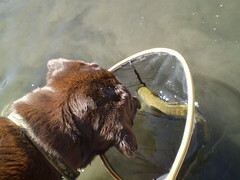 He is in a much happier place and chasing much bigger fish than here in Colorado for sure! Always a Character with a Happy Face! 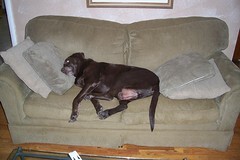 Downtime after another Fishing Trip! Where did Zeke spend his last few hours before heading to the Holy Water? Well no other place than one of our favorite spots in the Mountains riverside and playing with trout! 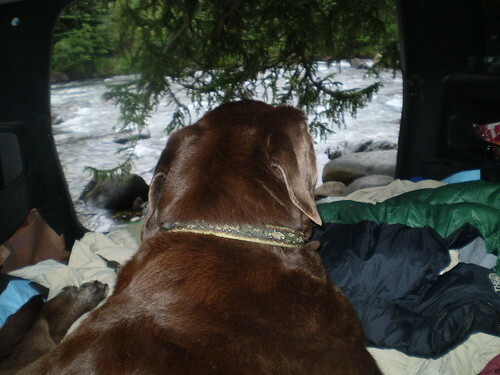 Zeke was not able to walk at all his last week due to nerve damage, so when he was tired of looking at all those trout jumping from the comforts of his large bed in my jeep, I brought him down for a look. Zeke was such a trooper that despite not being able to have the use of his back legs I walked him out to the river where he charged out like a hungry bear for a quick swim...I said "Zeke what are you doing?" 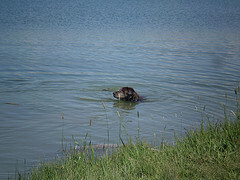 than realized that he loved the water so much that even though he couldn't walk...he still found the courage to get into that water for one last swim! 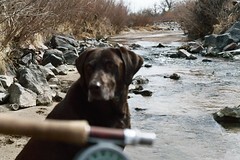 What an amazing fishing buddy that will undoubtedly be with me every time I'm on the River. 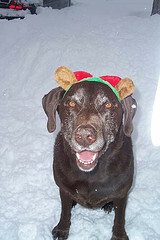 Zeke Duggan -AKA TroutDawg Jr.